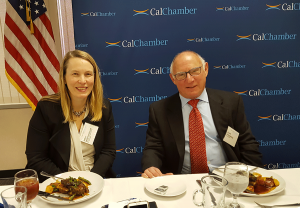 We are in extraordinary times right now, but that is punctuated by a lot of uncertainty, California Finance Director Keely Martin Bosler commented yesterday to a luncheon audience of more than 100 business leaders at the California Chamber of Commerce. Highlights of the presentation are included in the latest CalChamber Capitol Report video. 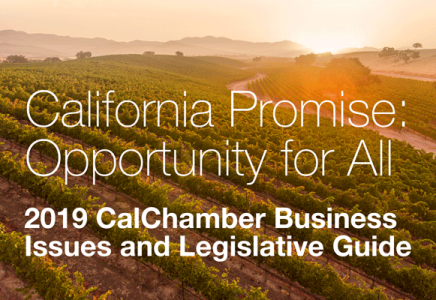 With an easy manner but commanding the details, Bosler covered five areas in Governor Gavin Newsom’s budget proposal of interest to the business community: budget resilience, education, paid family leave, housing, and federal tax conformity. “… the up and down of the stock market toward the end of the year and into the new year, as well as the federal shut down and everything that’s happening Washington, D.C.—all of those things give myself and my economist and those who forecast my revenues some pause about what we are going to see in the future,” Director Bosler told the luncheon group as a preface to her presentation. $4.8 billion to pay down unfunded retirement liabilities. The budget’s remaining spending prudently charts the path toward building a long-term fiscal foundation, Bosler explained. More than 86% of the new spending in the budget is for one-time purposes, and in each of the out-years the budget has a positive operating balance, she said. The budget also more than quadruples the size of the state’s safety net reserve, strengthening programs that provide the first line of defense for families during an economic downturn. Working on all the prior work from the administration of Governor Edmund G. Brown Jr., the Newsom administration plan for 2019–20 proposes significant investment in the state’s rainy day fund. Bosler projects that the fund will have $15.3 billion by the end of the budget year, and that the amount will grow to approximately $19.4 billion by 2022–23, absent an economic downturn. Director Bosler explained that the Newsom administration has a legal opinion which states that deposits made into the Rainy Day Fund from the end of the Brown administration do not count toward the constitutionally mandated 10% savings rate. The Newsom administration agrees with the legal findings. Therefore, the state will not be meeting the state constitutional target until 2022 or 2023, which means that the state will continue to make mandated deposits into the reserve for the foreseeable future. “We think that’s a really good thing for helping the state weather the next economic scenario,” Bosler said. Director Bosler affirmed that the administration is committed to expanding the Paid Family Leave program with the goal of ensuring that all newborns and newly adopted babies can be cared for by a parent or a close family member for up to the first six months. The budget proposes to adjust the reserve requirement for the fund that supports the Paid Family Leave program. This change will enable the state to make a down payment in expanding Paid Family Leave in the upcoming budget year while maintaining an adequate reserve. To address California’s housing crisis, the budget includes a $1.3 billion one-time General Fund allocation and a new approach to spur housing development to address the state’s affordability crisis and promote economic growth. The budget also expands state tax credits to further develop both low- and moderate-income housing, and proposes new innovative housing on excess state property. The Governor is making a sizable one-time investment to really get local governments doing things differently, Bosler said. Local governments that meet regional housing goals will receive additional funds, but those that don’t meet those goals may eventually see transportation dollars diverted elsewhere in the state, Bosler explained. She remarked that California just isn’t seeing housing permits at the level needed to keep up with the natural growth of the state. She estimated that there were maybe 113,000 units granted permits statewide when California needs 200,000 built every year. The Governor also is proposing to conform state tax law to the new federal opportunity zone provisions, which would provide relief from some capital gains taxes for investments in affordable housing and green technologies in newly-designated Opportunity Zones. Director Bosler explained that California continues to work through a lot of changes to the federal tax laws to relieve the administrative burdens of compliance. The Governor has proposed a more-than-doubling of the state earned income tax credit, but is considering making up for the lost tax revenues by conforming some Californian corporate and income tax provisions to changes made in 2017 by federal tax reform. A few of the large tax conformity items the state is considering, are the limitation on pass-through losses for non-corporate taxpayers, limiting fringe benefit deductions, and like-kind exchanges, plus conforming accounting rules for small business. The funding guarantees for K–12 schools and community colleges in 2019–20 is $80.7 billion—a new all-time high with per-pupil expenditures now nearly $5,000 higher than just seven years ago, Bosler explained. “Overall this budget provides around $500 per pupil more than last year,” Bosler said. The budget funds critical work to build a longitudinal data system to better track student outcomes and increase the alignment of California’s educational system to the state’s workforce needs. The budget also includes a $750 million one-time General Fund expenditure to address barriers to full-day kindergarten. Bosler remarked that about one-quarter of students enrolled in kindergarten do not have access to a full-day kindergarten program. To address the rising costs of pensions in the California State Teachers’ Retirement System (CalSTRS) and provide immediate relief to districts, the budget proposes a $3 billion one-time non-Proposition 98 General Fund payment to CalSTRS on behalf of schools. Bosler called this move “extraordinary.” Overall, this payment is expected to provide immediate relief to school districts and will reduce the out-year contribution rate by half a percentage point. She said there is going to be an investment into a longitudinal data system that tracks how children move from the local educational system and into higher education, and ultimately into the workforce. “There is going to be a lot of discussion over the next few years about how we better connect the skills that you all need as employers in the state with what is being produced by both our K–12 system and also our higher education system too,” Bosler told listeners. Bosler said that Governor Newsom has learned a lot about California’s higher education system since spending the last eight years sitting on the California State University Board of Trustees as well as the University of California Board of Regents . The budget includes $1.4 billion ($942 million ongoing) for higher education to support increased enrollment, improved time to completion of a degree and a tuition freeze. The budget also proposes funding for two free years of community college tuition for first-time, full-time students. University of California—$240 million ongoing General Fund dollars for operational costs, student success, student hunger and housing initiatives. This also includes $138 million one-time General Fund appropriation for deferred maintenance. California State University—$300 million ongoing General Fund allocation for operational costs, increased enrollment, and for continued progress toward the equity goals of the Graduation Initiative 2025. The budget also includes $247 million in one-time General Fund monies to expand on-campus child care facilities serving students and deferred maintenance, and $15 million in one-time General Fund dollars for student hunger and housing initiatives. Community Colleges—$402 million ongoing Proposition 98 General Fund allocation, including a 3.46 % cost of living adjustment (COLA), enrollment growth, legal services for undocumented students and families, and providing a second year of free tuition. The department isn’t predicting a recession, but is modeling one to understand how bad it could get, she said. The model shows a revenue decline that isn’t as bad as the last recession, but a little bit worse than the recession in 2000–01. Bosler explained that the state will actually see a $70 billion drop in revenues in just a three-year period, according to the forecast.